BH Cosmetics . Brown . EOTD . Eyeshadow . Fall . Fall look . FOTD . Green . Look book . Makeup . Palette . Review . WetNWild . Yellow . BH Cosmetics is no doubt one of my favourite brands because they offer great quality at a very budget-friendly price and a wide range of colours (they actually have all the crazy colours I am usually fond off). In fact, their range is quite large for such an affordable brand. They are also cruelty-free, which is always a good thing. This palette is not an exception and I bought it without having read any review about it, just because I was attracted to the bright shimmery shades, especially the blues, turquoise and green. The housing of the eyeshadows is very basic matte black plastic with a transparent plastic lid. Really thin and quite lightweight. I personally prefer the opaque lid as opposed to the transparent one because the black one feels a tad sturdier. But you I have to admit it is really practical to be able to see the content of the palette without even opening it. The palette does not include a mirror, which is not a problem for me, but what could bother some people. Anyway, I don't think it's a palette I would use on the go, because of its size. I find it easy to open and close (unlike other budget-friendly palettes). It is nothing special but it looks durable and easy to clean. I don't have major aesthetic criticism because they are not trying to impress with packaging and probably saving on the packaging they are able to sell for such and affordable price. Which is absolutely fine for me! I do like luxurious packaging and high-end brands! I really do. But I understand that is not at all what BH cosmetics are about, they focus more in the product and the price range. The 28 colours contained in this palette are all shimmery, with a metallic "foil" finish. Now, talking about the quality of the shadows, when swatching them with my fingers they all are very pigmented with a great pay off. While working with the brush on my eyelids (I haven't tested all the 28 colours yet, only twelve) I think the colours show up nicely and pigmented, without kick-off or fall out. I LOVE how the palette is organized, I find it is perfectly coherent, like most palettes from BH Cosmetics that I have (which for me is one of the strong poins of BH Cosmetics, to organize the colours in a functional way for the artist). They seem to be organized by colum: the first column has the very light shades that work perfectly as highlighters, second column are grey-ish neutrals, third column for turquoise and teal, fourth column green and yellow, fifth columnpeach/orange and copper, and sixth column warm browns and bronze. In each column, you find lighter and darker shades, some cooler and some warmer tones, so I'd say the variety is there in terms of colour, most probably none of your look will look the same and the possibilities are endless! While I would recommend the BH Cosmetic Blushed Neutrals palette to every makeup lover who would appreciate warm colours, the Foil Eyes palette is mostly for the bold. Above all Foil Eyes is not a stand-alone palette, neither is Blushed Neutrals, but they both complement each other really nicely! Foils eyes is basically a palette with a nice collection of options to give your lovely pops of colors to your look. The palette includes 4 very pretty highlighting shades, but it doesn't have any matte shade which a must-have to balance your look. In summary, if you like to be creative with your eye looks, a little edgy when possible, using a product of nice quality for an affordable price: you will enjoy this palette! 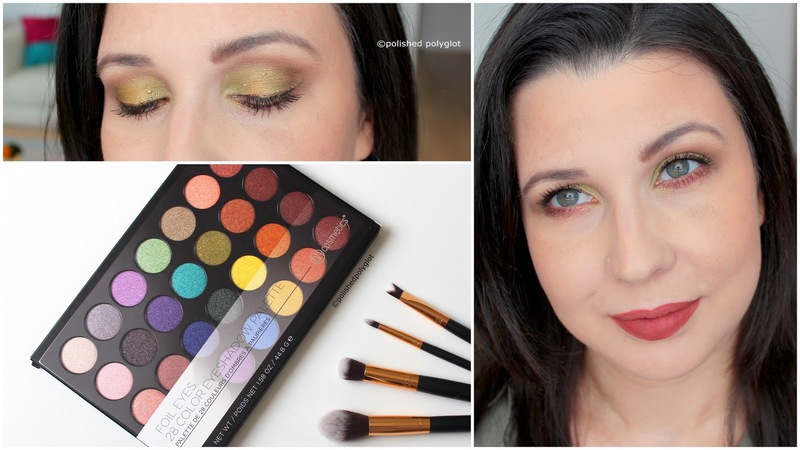 For this look I used both palettes BH Cosmetics Foil Eyes and BH cosmetics Blushed Neutrals. First I created a transition gradient in the crease using two matte shades from the Blushed neutrals palette. Then, in the center of the mobile lid I applied a beautiful medium green from the Foils Eyes palette (fitfh column from the left second colour from the top) that I topped with the two yellow shades in the same column, forming a gradient, so that it looks like the colour has dimension and it glows from within. I really love this effect! And I if you look closely, all the columns are designed to give this kind of ultra cool effect! In my lower lashline I used a brown blended to a reddish shade from the Blushed neutrals palette. I drew a very thine liner line on my upper lashline using Chanel graphic liner #117and lots of mascara.On the face I applied a lusher by Wet and wild and a bronzer by Givenchy. On the lips I used a matte lipstick by Wetnwild. Unfortunately, the lighting wasn't very good, as I took the pictures quite late in the day, it's crazy how short have already become the daylight duration! my picture colors lack a little vibrance and definition. My photos do not do justice to the beauty of the shades! The BH Cosmetics Foil Eyes palette is available here and it retails for USD 12.50 while the BH Cosmetics Blushed Neutrals palette is available here and it retails for USD 13.99. What do you think of this look? Have you heard of this palette before? Is this something that could interest you? Let me know in the comments!